House of Cards exposes dictatorship of the 1% | Fight Back! For all of the scandal and sensationalism, House of Cards makes one point incredibly clear: Working people have no voice in the United States government. The wildly successful Netflix original series, which began in 2013, struck a nerve with a broad audience of people disillusioned with the broken promises of the Obama administration and the suffocating dominance of giant banks and corporations in their lives. Netflix released the second season in its entirety for online streaming on February 14, and a staggering 16% of Netflix's 29.4 million subscribers streamed at least an hour of the show in the first day. There is an easy answer for why House of Cards is so popular with viewers. Each episode is ripped straight from the headlines, offering viewers a fictional but very realistic understanding of the way the U.S. government works. Underwood and President Walker are not Tea Party Republicans. They're Democrats, based loosely on Barack Obama and Bill Clinton, but it does not stop them from collaborating intimately with billionaires and major corporate lobbyists to pass legislation that harms working people. It does not stop them from using a massive NSA-style surveillance program to jail and literally kill journalists and dissenters. True to life, these fictional Democrat politicians took massive campaign donations from labor unions during the election, but it doesn't stop them from breaking a national teachers strike over a privatized education bill early in season one. In other words, this is a show about the age of Obama, firmly in-touch with the betrayals of the Democratic Party and the patently undemocratic nature of the U.S. government. You get the impression that all of the characters in the show are real and only the names are different. At times it is as absurd and self-indulgent as a tabloid cover, but after eight years of Bush and five years of Obama, does anyone really think the U.S. government is above that? 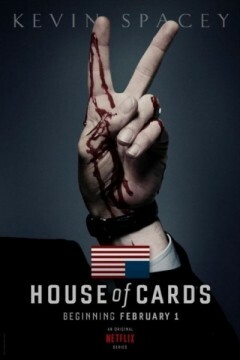 House of Cards makes clear that Congress is not there to represent the people and pass legislation. The examples it uses hit close to home. A bill regulating environmental pollution gets canned by the political maneuverings of Remy Danton, a brutally efficient lobbyist for a massive natural gas corporation called SandCorp. No doubt activists in the anti-fracking and climate change movements can relate. A government shutdown allows the President, the Democrats and the Republicans to gut Social Security by elevating the retirement age, not unlike the chained-CPI cuts to Social Security proposed by President Obama last year. Funding for critical infrastructure projects like bridges – in other words, jobs for unemployed workers – gets regularly denied based on the whims and profit margins of billionaires. Since Underwood is the Majority Whip in the House of Representatives for season one and the President of the Senate in season two, we get to see politicians from both parties working hand-in-glove with the corporate interests that put them in power. Rather than representing their constituents, politicians represent the capitalists who live in their state or district. When corporate interests do conflict, we get the resulting disagreements between the Democrats and Republicans. They never actually disagree on the fundamentals. Debates are limited to which section of the capitalist class is helped or hurt by legislation, and the wealthiest monopolies usually win out. Workers and union members who show up at the Capitol to lobby their representatives are dodged and lied to, like we see in season one with Pennsylvania congressman Peter Russo. House of Cards forces the audience to question the effectiveness of lobbying as a strategy for social change. People thinking that the U.S. government is even slightly democratic would do well to reflect on the show too. Occasionally President Walker and his staff talk about public opinion, but it's always in the context of how the administration can cover up some scandal or peddle some rotten policy proposal, like privatizing education or cutting Social Security. The actual felt needs of working people never factor into the President's political calculus for even a minute. All of this from a president that has multibillionaire and monopoly giant Raymond Tusk on speed dial throughout the show. One of the most sinister subplots in House of Cards involves government repression of journalists and dissenters. From the NSA to the Oval Office, government agents monitor the phone calls and e-mails of anyone who disagrees with their policies. In season two, Underwood's chief of staff orchestrates the jailing of a journalist on the cusp of exposing Underwood's role in two murders. When a Secret Service agent involved in the plot protests, saying that the journalist committed no crime, Underwood's aide Doug Stamper responds, “But he wants to, and you will help him [commit a crime].” Using a hacker-turned-informant, they give the journalist the tools to hack a phone database and bust him immediately, charging him with cyber-terrorism and forcing him to take a plea deal involving prison time. It is the stuff conspiracy theories are made of, until you realize that this government repression happens all the time in the U.S. Collaborating with President Obama and the Justice Department, Chicago mayor Rahm Emmanuel set up and charged three organizers of the massive protest against NATO in 2011 with terrorism. A little over two weeks ago, a jury found the NATO 3 not guilty of terrorism because the undercover police agents had instigated the whole plot themselves. The NATO 3 still face serious prison time on lesser charges, because of the political nature of their prosecution. Similarly, 23 anti-war activists and organizers of the 2008 protest at the Republican National Convention were raided by the FBI in 2010 after the state placed an informant in their midst. At the time of writing, the Justice Department has still not dropped the investigation of the Anti-War 23. Some of the most interesting moments in season two are the interplay between Beijing and Washington, whether its extradition deals involving a corrupt Chinese businessman or negotiated withdrawal of warships from the Sea of Japan. Through a trade war that erupts over Chinese investment in a domestic infrastructure project, House of Cards makes clear that the long-term policy orientation of the U.S. government is towards a war with China. In this way, the show disturbingly parallels President Obama's military 'pivot towards Asia' and renewed anti-China rhetoric from right-wing Japanese President Shinzō Abe. However, unlike much of the China-bashing in recent films and TV shows, House of Cards offers genuine points of contrast between the People's Republic of China and the capitalist regime in the United States. For corruption and money laundering, Underwood and multibillionaire Raymond Tusk face 50-50 odds for conviction, prison sentences in a comfortable federal penitentiary and a possible presidential pardon up their sleeves. For the same scheme, Chinese businessman Xander Feng has the death penalty waiting for him back in Beijing, according to one of the show's characters. Both countries have billionaires, but while the U.S. government protects them from prosecution, the Chinese government regularly imprisons and seizes the wealth of multimillionaires and billionaires. In the last eight years, the Chinese government executed 14 billionaires for corruption, money-laundering and theft. House of Cards gains a lot of credibility by showing the favored class treatment that billionaires get from the U.S. government and contrasting it with China. For all of the realism of House of Cards, there is one disappointing omission: the continued occupation of Afghanistan and the U.S.'s imperialist war projects in other countries. The show makes a few references to drone strikes, but it loses some credibility by not exploring the U.S. government's pro-war agenda or its attempts to destabilize foreign governments. As the U.S.'s role in financially backing the far right-wing protests in Venezuela and Ukraine, along with the two and a half year rebellion in Syria, comes to light, House of Cards will need to introduce these elements in the announced third season to maintain the show's believability. Nevertheless, progressive organizers and activists would do well to see what has millions of people across the world tuning into House of Cards. The show is fast-paced, well written and features a masterful cast of interesting (and despicable) characters. But the real draw to House of Cards is how thoroughly it examines the U.S. political system and exposes its pro-corporate, anti-worker nature. Seasons 1 and 2 of House of Cards are available for instant streaming on Netflix.